Four lodge rooms are furnished with two double beds and a private bath, and one lodge room is handicapped-accessible with one double bed. 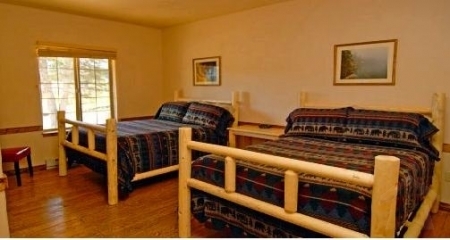 Our log cabins are a little more rustic, furnished with double and single bunk beds and a half-bath, and comfortable and cozy for both families and singles. 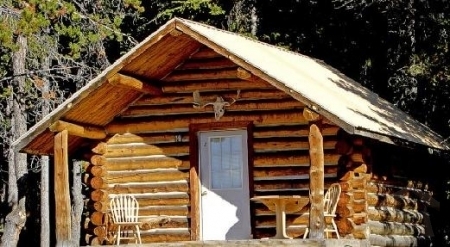 Cabins will accommodate four to five people; cabin dwellers share a very adequate shower house. Our Timberline cabin with loft accomodates 8-10 with its own bath. Adults and children alike will relax and revel in the peace and quiet of high country surroundings. With so much to see and experience, no one will miss ringing telephones and blaring televisions. Relaxing outside on the deck under a summer night’s star-filled sky is a profound change from the noise and bright lights of the big city. The brisk, evergreen-scented air and calming music of a mountain stream provide the perfect background for a refreshing night’s sleep after an adventure–filled day. Meals are served family style, both in the dining room and on the deck. Informality is the order of the day—you won’t see dinner jackets in our dining room. If you like, “bring your own bottle” for a cocktail before dinner and we’ll be happy to supply the ice and the mix.